A SUPPORTER of the pressure group Dads Against Discrimination has claimed responsibility for the hoax bomb on the A38 that left Plymouth gridlocked on Friday, the WMN can reveal. In an anonymous letter to the group's leader, Mark Harris, of Plympton, he claims that he and another person planted the fake device to highlight the anguish of divorced and separated fathers denied access to their children. Referring to a newspaper cutting on the incident, which closed both lanes of the A38 for almost six hours and caused traffic jams throughout the city, he says in a note to Mr Harris: "I and another are starting a campaign over access. Attached... a copy of what we did." Mr Harris, 41, who leads demonstrations by aggrieved fathers across the Westcountry and in London, was quick last night to distance the campaign group from the incident. Bomb disposal experts had to be called to explode the device - found under an information board near the Deep Lane turning on the Exeter -bound carriageway - which was designed to look like a genuine bomb. Mr Harris said: "This is someone who has attached himself to the group. We would never condone something like this that disrupts the public or could jeopardise public safety. "I don't know who it is. Feelings are running high. Divorced fathers feel they are suffering a grave injustice at the hands of the legal system that denies them their basic right to see their children. It is someone who has gone beyond the limit. But if you push people too hard they can lose their reason. "If you take a man's responsibility away from him - ie, his children - then he probably starts behaving irresponsibly." The note, which was dropped through Mr Harris's door in what he describes as "the dead of night", refers to a demonstration in Trafalgar Square last Monday, attended by about 200 fathers from the Westcountry and another 200 from around the country. Mr Harris believes the person who planted the device is "definitely local". The note singles out the head of the Family Division of the Courts, Dame Elizabeth Butler-Sloss, who lives at Marsh Green, Exeter, and whose home has been a regular target for the group's demonstrations. It says: "Don't think Butler -Sloss and her judges are listening to the protest. I and another are starting a campaign over access rights. Attached a copy of what we did. Both have contact orders but cannot get them enforced." It adds: "We did this in light of what the UK government are doing - opting out of the European council motion to have enforceable access rights across Europe." 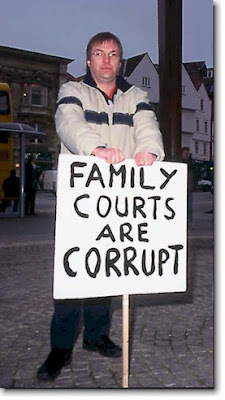 The letter is signed: "Dad, denied access two years..."
Mr Harris, who has three children from his former marriage and is campaigning for increased access to them, said last night that the group was fighting for shared access to become the norm in accordance with the Children Act and European protocols. A fellow supporter of the group, who has asked not to be named, said last night: "If people are denied basic human rights, it's hardly surprising that they feel they have to do things like this to draw attention to their suffering." A CID spokesman last night confirmed that police were investigating and took the allegations seriously.